October 11, 2017 (Santa Rosa) -- Wine industry leaders have formed a support network to provide immediate assistance and long-term aid to victims of the fires ravaging Northern California and are calling on the national wine community for additional help. Organized by a group of association leaders representing the Golden State’s major winegrowing regions, support efforts include fundraising and creation of an online resource where vintners can find and offer resources, such as generators, trailers, lodging and manpower. October 10, 2017 (San Diego) -- The San Diego County Board of Supervisors voted Tuesday to restrict drones from flying near or over fires and locations that have public safety temporary area restrictions to ensure public safety. WILDFIRES TO OUR NORTH - ARE YOU READY HERE? October 10, 2017 (San Diego) - Wildfires burning in Anaheim and Northern California should remind you we’re in the thick of fire season, and that one could flare up any moment. Now’s the time to take stock of your emergency supplies and review your family emergency plan. Would you be ready to react if you got notice of a fast-moving fire threatening homes in your community? Read more about WILDFIRES TO OUR NORTH - ARE YOU READY HERE? October 9, 2017 (Tecate) – A brush fire is burning just south of the border in Tecate, Cal Fire Captain Isaac Sanchez advised in a phone interview with East County Magazine. Cal Fire has positioned resources on the U.S. side of the border to prepare in case the blaze crosses over. “I've seen 4 fire trucks heading out the 94,” Candie Wemple said in an email to East County Magazine. Posts on social media indicate black smoke is visible from Campo, Potrero and Barrett Junction. October 9, 2017 (Crest) -- At approximately 8:40 a.m. this morning, a driver lost control of their vehicle on the 2200 block of La Cresta Rd in Crest and crashed into a residential gas meter. The driver was transported to the hospital with minor injuries. Due to difficulty in securing the gas leak, La Cresta Rd could be closed up to 12 hours, into this evening. October 9, 2017 (San Diego ) – Governor Jerry Brown has declared states of emergency in Napa, Sonoma and Yuba Counties due to wildfires that have burned at least 1,500 homes and commercial buildings and killed at least one person, Cal Fire director Ken Pimlott said at a press conference today. There is zero percent containment as of late morning. At least 16 major fires are burning statewide. An estimated 20,000 people have been evacuated as fires blacken skies even in Bay Area cities, forced evacuations of hospitals, shut down schools and threaten thousands more structures in California’s wine region, gold rush towns and even coastal counties. Many residents fled for their lives during the night as fast-moving flames destroyed wineries, vineyards, major stores and homes, dousing dreams with despair. Update 2 p.m.: The Canyon 2 Fire has exploded to over 2,000 acres and has burned homes in the Anaheim Hills, ABC 7 reports. Ashes are falling at Disneyland. October 9, 2017 (Anaheim) – A fast-moving brush fire, #Canyon2Fire that started off East Santa Ana Canyon Road and Gypsum Canyon Rd. near the junction of highways 91 and 241 in the Anaheim Hills area of Orange County has jumped across highway 241, also forcing closure of highway 91, Anaheim Fire and Rescue Department reports. October 7, 2017 (Julian) -- I am a retired psychologist and not a journalist or investigative reporter. As a psychologist, my job was to listen. Maybe that is why so many individuals come and tell me “what’s going on.” I have become a repository of information about our fire department and I believe I need to share what I am hearing because it affects the lives of all of us living in the Julian-Cuyamaca fire district. October 7, 2017 (San Diego’s East County) -- Residents from San Diego's East County testified during the open comment period at last Thursday’s California Public Utility Commission (CPUC) meeting in Chula Vista. 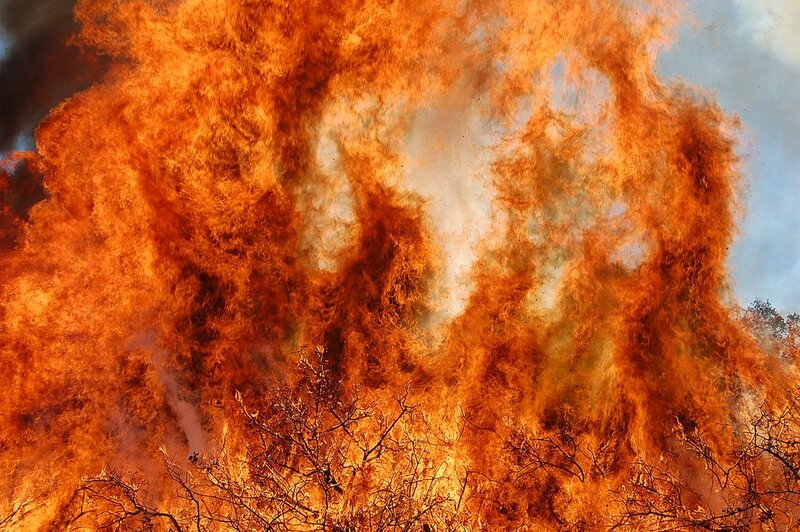 Earlier in the day, the CPUC held a hearing on whether or not to approve a recommendation made by two CPUC administrative law judges to reject SDG&E’s application seeking to charge ratepayers for its uninsured losses in three of the 2007 wildfires. That hearing consisted largely of technical arguments. Afterward, a second meeting in Chula Vista was held for all parties involved, and public testimony was also taken. October 3, 2017 (Spring Valley) -- As the fire season approaches, San Miguel Fire District is kicking off Fire Prevention Week with an Open House on Saturday, October 7 at four of its fire stations in the East County. * How to develop an Emergency Plan for the family. Firefighters in each station will be available to answer questions. Kids will be given Firefighter helmets and fire badge stickers. October 2, 2017 (Washington D.C.) – The U.S. Forest Service, in a series of messages sent on its Twitter account, warns that the growing cost of wildfires is taking money from other programs –including those that reduce fire threats. September 24, 2017 (Alpine) -- Nearly 60 East County residents attended the first open house held by the Sunrise Powerlink Fire Mitigation Group (SPFMG) at the Alpine Community Center on Sept. 19. The purpose of the open house was to educate residents about the fire mitigation grants program and the results of the 2017 grant program. Update: The CPUC has announced it will hold this agenda item slated for the Thursday morning hearing, meaning no vote will be taken on this agenda item. Public comment will still be accepted before all five commissioners at the start of the mornng hearing . Public comment will also be taken during an all parties meeting later in the day, but not all commisioners will be present at the later meeting. See more details at the end of this story. September 26, 2017 (San Diego) –The California Public Utilities Commission will hold a public hearing Thursday at 9:30 a.m. in the Chula Vista City Council Chambers (276 Fourth Ave., Chula Vista) on the CPUC’s proposed decision to deny SDG&E’s application to charge ratepayers $379 million for recovery of its uninsured losses related to the 2007 Witch, Rice and Guejito wildfires. A similar request for $594 million was previously denied in 2012. SDG&E sought to recover those losses through a Wildfire Expense Memorandum Account (WEMA). The proposed decision against SDG&E has drawn praise from some, including Supervisor Dianne Jacob, but concerns from others including a fire survivor and intervener in the case. Some ratepayer advocates also warn that the CPUC could change its mind on the proposed denial of SDG&E’s WEMA application or postpone action following ex-parte lobbying efforts by the utility company. CHIEF'S CORNER: ARE YOU READY? SANTA ANA WINDS! September 25, 2017 (San Diego's East County) - Santa Ana winds are in the forecast, are you ready to be prepared in the event of a brush fire? Warm temperatures, low humidity and off shore winds are elevating an existing high fire danger. Read more about CHIEF'S CORNER: ARE YOU READY? SANTA ANA WINDS! This year's wildfire season is the most expensive on record. Last year, the Pioneer Fire burned nearly 190,000 acres of the Boise National Forest. September 25, 2017 (Boise, ID) -- A rare moment of bipartisanship is catching on among Western states' members of Congress with a bill to treat wildfires more like other natural disasters. September 24, 2017 (Spring Valley) – This morning around 1:30 a.m., San Miguel Fire District Engine 16 and Brush 14, along with San Diego and Bonita Fire, responded to a vegetation/trash fire at a homeless encampment near Spring Canyon Drive in Spring Valley. September 24, 2017 (Julian) -- "Backcountry Strong!" That's what the Julian Cuyamaca Fire Protection District is, and wants you to know it! The Julian Volunteer Fire Company Association and the Julian Fire Plugs will be holding a spaghetti dinner fundraiser Saturday, September 30 at 5 p.m. at Station 56, located at 3407 Hwy 79 in Julian. They will be accepting donations and offering spaghetti, garlic bread, salad and drinks. They even have vegetarian options available. There will be speakers and entertainment. September 19, 2017 (El Cajon) -- This Saturday September 23, San Miguel Fire District Firefighters will be flipping pancakes and serving breakfast in support of the San Miguel Firefighters Charitable Foundation. The breakfast will be held at Fire Station 19 located at 1273 Clarendon Street in El Cajon from 8 a.m. to 11 a.m.
September 14, 2017 (San Diego’s East County) - The Sunrise Powerlink Fire Mitigation Group (SPFMG) invites you to a public open house where you can learn more about the fire mitigation grants program and the results of the Year 2017 Grants Program. The open house will be held Tuesday, September 19 from 6 p.m. to 7:30 p.m. at the Alpine Community Center, 1830 Alpine Blvd. in Alpine. September 7, 2017 (Jamul) - Members of the Jamul Indian Village tribal government presented $2,677,500 to the San Diego County Fire Authority Tuesday at the fire station across the street from Hollywood Casino Jamul-San Diego. This is on top of a recent $1.1 million contribution toward road and traffic improvements. September 3, 2017 (San Diego) -- Have you ever wondered how firefighters determine which homes to defend and which ones we don’t during a wildfire? As firefighters, we lay out our plans for the tactical operations before a brush fire by pre-planning our districts. During a brush fire, it’s imperative that we make quick but well-thought-out decisions that reflect life safety issues for both responders and citizens first, followed by property conservation. September 2, 2017 (Dulzura) – The Border Fire south of Dulzura is now 75 percent contained and has charred an estimated 130 acres, according to Cal Fire. The brush fire began yesterday along Highway 94 near Marron Valley Road.It is currently spreading to the northeast and is not expected to impact populations. Firefighters will remain on scene constructing containment lines and mopping up hot spots. September 2, 2017 (Lakeside) – A vehicle fire on Wildcat Canyon Road ignited dry brush, just north of Muth Valley Road and south of Pata Ranch Road. Named the Ranch Fire, it charred an estimated three-quarters of an acre this evening before forward spread was halted, Cal Fire reports. September 1, 2017 (Dulzura) – A Cal Fire helicopter assigned to firefighting on the Border Fire south of Dulzura today made a hard landing in a field adjacent to the brush fire. The pilot was the sole occupant on board and did not suffer any injuries, Cal Fire reports. Update 11:40 a.m. The fire is now 15 percent contained and has burned 120 acres, Cal Fire reports. Update 10:45 a.m. Fire is now 110 acres and still zero percent contained. SDG&E's helicopter, several fixed wing aircraft and over 220 firefighters are among the resources at the scene. September 1, 2017 (Dulzura) -- The #BorderFire burning in Dulzura has charred at least 50 acres of brush and is zero percent contained. The blaze began at 5:40 a.m. near State Route 94 and Marron Valley Road. There are no road closures at this time. The fire is burning to the north and east. Resources committed include 20 fire engines, 10 hand crews, 7 water tenders, 3 bulldozers, and 3 Type II helicopters.